The Galway Tent Blog: Toxic Slag Permitted by Mr. Gormley's DDDA At Nature Site? Toxic Slag Permitted by Mr. Gormley's DDDA At Nature Site? Apparently the Dublin Docklands Developers Authority has authorised the dumping of a mountain of potentially toxic slag beside Irishtown Nature Park. Apparently the EPA is toothless, indifferent and possibly even criminally negligent(a). John Gormley, July 18, 2005. JG/RM. Following the Poolbeg Incinerator oral hearings the Bord Pleanala Inspector reported pollution from particles in Poolbeg was already at or above acceptable legal norms. The Inspector specified measures should be taken to reduce particle pollution during construction. So now, even before final approval from their EPA buddies on behalf of foreign corporations, DDDA+DCC is breaking this condition. With this reckless attitude why would DCC control invisible dioxins? 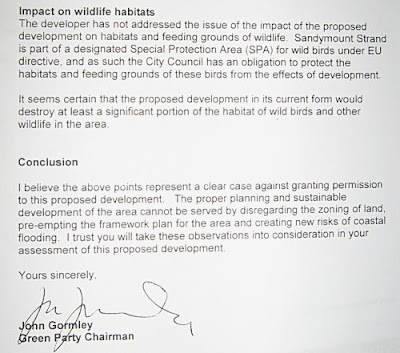 The Dublin Docklands Developers Authority is a taxpayer funded quango in Mr J. Gormleys's control. The quango is used to perform Chinese style autocratic urban planning. For instance, the quango prevents access to the Bord Pleanala planning process by educated citizens. The quango hides information from the public. Dumping the potentially toxic slag may be a pre-emptive action by DDDA+DCC or others to destroy the land used by Brent Geese (fresh water, flight paths). The reckless and possibly illegal work appears to be in advance of authorisation from their cronies in EPA-Ireland for a Waste-To-Toxins incinerator. Apparently EPA-Ireland will not investigate the "sand" - the fine public protectors first require a piece of paper, their usual excuse apparently. Invisible 'fine particles' from this 80 foot high mountain blow over Sandymount, Irishtown and Ringsend damaging human health. But DCC & DDDA will say "you can not prove that". DCC's sewage factory stinks and wastes tens of millions of emergency tax-payer cash, signed for by Mr J Gormley in November 2008. Whether this unforseeable situation is due to corruption or bad engineering by DCC is an open question. However DCC is used to engineering schijt. An efficiently managed Waste-To-Toxins incinerator would reduce life by 100,000 man-years in its first 15 years [British Society for Ecological Medicine]. An ineptly or possibly corruptly managed Waste-To-Toxins incinerator will cause tens to hundreds of premature deaths across Dublin, each year. Do you trust DCC with your life expectancy? Do you trust Covanta, a corporation with a curious regard for obeying the law in its home state of New Jersey. (a) The EPA Charade By Susie Madrak Wednesday Dec 10, 2008 4:01pm. The Philadelphia Inquirer's been running a good series about the toothless, indifferent and possibly even criminally negligent EPA. The list of charges includes allegedly bribing councillors Sean Gilbride, Cyril Gallagher, Jack Larkin, Tony Fox, Tom Hand, Don Lydon, Liam Cosgrave and Colm McGrath. The Federal EPA under Bushco is a fraud and a joke--little more than extension of profit obsessed Corporate America who would willingly trade away the beauty of our land for a few pieces of silver and greater EPS. The cowards who perpetuated this fraud should be made to either live in the nest that the fouled or clean it up themselves. Is Ecocem just another smoke and mirrors outfit attempting to cash in on "green" credentials? OK, this is just a sideshow compared to the W-to-E show up the road. 1 tonne of steel produces ~2 tonne of CO2 and 0.2 – 0.4 tonne slag. So a tonne of slag "produces" ~6 tonne CO2. Adding the transport by sea and land, and whatever additional processing it takes to produce green cement from it and it would seem there is little global environmental benefit from recycling this waste, except on a purely local accounting basis and possibly as a means of just disposing of the waste. CO2 emissions in the manufacture of conventional cement are in the range of 0.9 – 1.25 tonne per tonne of product. I stand to be corrected on these figures but they look very much in the ballpark from pursuing the available data – another con job?